Bollwer AG is focused on establishment and development of active economic relationships at different levels and in different spheres of economy. It works with existing as well as with developing markets such as: China Republic, India, Iraq and Pakistan in order to provide a good base for economic development and success for itself and its affiliated partner companies. Bollwerk AG operates its own budget, invests in industry and infrastructure projects and has a vast network of access to different financial structures, such as: funds, international financial institutions, big private and State banks all over the world. 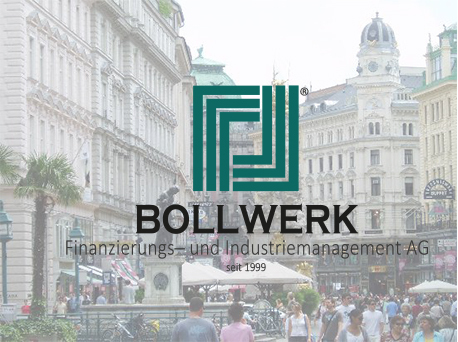 BOLLWERK company was founded in 1999 in Vienna (Austria) and now holds shares in different enterprises – either in the form of direct investments, or by way of affiliated and subsidiary companies. Trust and confidentiality are the main values of our company’s philosophy, prompt response and efficiency – basic criteria of our business policy. In Austria, the Caribbean, China, Cyprus, Czech Republic, India, Italy, Latin America, Libya, Liechtenstein, Norway, Pakistan, Poland, Romania, Russia, Serbia, Slovenia, Spain, Sweden, Switzerland, Thailand, Ukraine and USA.